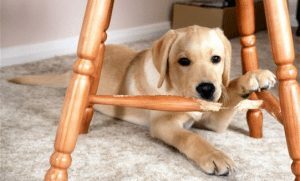 When we think of a dog that likes to chew, most of us think about inappropriate chewing, such as the chewing of furniture, clothes, children’s toys etc. However, chewing in dogs is a completely natural behaviour! Did you realise that it’s actually really important that a dog is encouraged to chew? The trick is in making sure that they are chewing appropriately! 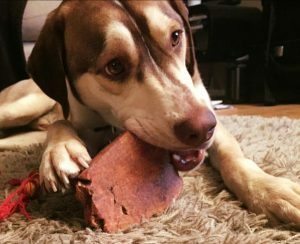 By providing a dog with plenty of appropriate chewing opportunities from a young age, you can help discourage inappropriate chewing and ensure that he or she has the chance to carry-out this vital behaviour. Biting and chewing helps a dog relieve stress through releasing endorphins. Dogs that chew are exercising both mind and body. Chewing also helps to keep the teeth healthy and clean. Biting and chewing are natural hard-wired behaviours that are an inherent part of being a dog. Dogs chew to relieve boredom, loneliness, stress, frustration and anxiety. The act of chewing has a calming and comforting effect on the adrenal-pituitary axis in the brain. It triggers the release of endorphins, and as such is a tool that the dog has at his disposal in order to ‘self-medicate’ for anxiety and stress. 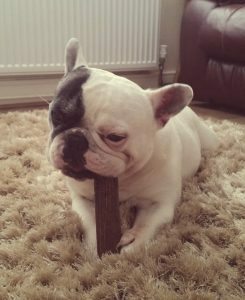 As well as the behaviour benefits, chewing appropriate toys and chews can help clean a dog’s teeth, remove plaque or aid a puppy through the difficult teething period. Adolescent dogs are also still teething and chewing often occurs at this time. So, how can you encourage appropriate chewing? That’s easy, by providing some of the numerous chew toys, mental stimulation toys and long-lasting, natural chews that are available! 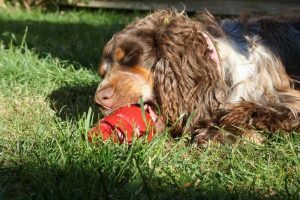 The most popular dog chew toy has to the Kong range of toys. Made of natural rubber, dogs find them irresistible to chew. Known for being robust, they are available in red for average chewers, or black for power chewers. There is also a puppy range, which has softer rubber for dogs under nine months. While not all toys designed for mental stimulation encourage chewing, many do. Kong toys are perfect for stuffing with treats or some of your dog’s daily food ration. 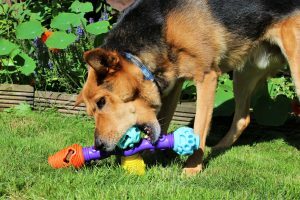 As well as the standard-shaped Kong toys, Kong Quest, Kong Traxx and Kong Stuff-a-Balls are all great toys for stuffing. Zogoflex Tux toys also make great stuffing toys, as do the K9 Connectables and Beco Balls. By far the simplest and most convenient way of encouraging appropriate chewing is by purchasing a natural, long-lasting chew. Ensure you purchase one that is a suitable size for your dog and contains no artificial ingredients; go natural! Our two favourite chews are completely natural, environmentally-friendly and sustainably sourced. Deer Antler chews such as the Farmfood Antlers or Pure Dog Stag Bars are extremely popular (both with dogs and their owners!) and are very long-lasting. They wear down slowly with the grinding action of the dog’s teeth and saliva, into tasty morsels. Eventually, the dry marrow is exposed as a lovely treat when the outside has been worn away. For younger or inexperienced dogs, there are also Easy Antlers, which allow the dog to reach the marrow without working so hard. Antler Bars are safe, won’t splinter or chip or cause blockages and they don’t contain nylon like some long lasting chews. They are not an ‘empty’ chew like rawhide and in fact, contain important minerals. They clean the dog’s teeth, rather than bung them up like some dog chews and they’re great for dogs with sensitive tummies. Even dogs who are losing weight can enjoy Antler Bars because they only contain a tiny amount of fat. Naturally, they don’t contain additives or preservatives. Anco Roots are a long-lasting chew created from an eco-sustainable source and completely natural. Anco Roots are safe and won’t splinter or chip. They clean the dog’s teeth and naturally, they don’t contain additives or preservatives. Arctic Freeze toys make perfect teething toys for puppies and adolescent dogs. This innovative range of cooling and teething toys contains 100% purified water and are designed to be frozen. Arctic Freeze toys are soft on the mouth, while durable and strong, therefore providing an icy chilled chewing sensation. The range also has special areas incorporated within each toy for treats to be inserted. This adds extra interactive fun, too! Rope toys such as Beco Jungle Triple Knot also make fabulous “teethers” for teething puppies and young dogs. They can be soaked in a very weak gravy solution or salt-free stock and then frozen. As well as the dog getting relief through chewing, the frozen rope will help to soothe sore gums. Made from hemp which is a very eco material as no pesticides are used in the growing process. Most importantly though it’s better for your dog; unlike cotton and synthetic ropes it has very short fibres which are more easily digestible. This means that if a piece of rope is swallowed it is much more likely to pass through the dog’s body without causing problems. 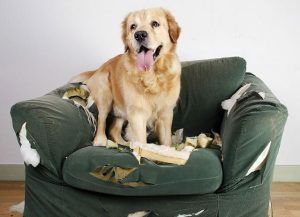 Dogs that chew may be experiencing separation distress or anxiety. Should you feel that this is the case, you may need to seek help from a Clinical Animal Behaviourist who can help you resolve the issue.